Shockwaves were sent around the world recently when it was reported in Germany that the health of Chronic Fatigue Syndrome patients improved on AIDS medications. It came as a surprise to everyone but Charles Ortleb, the publisher and editor who warned the world for decades that Chronic Fatigue Syndrome and AIDS are similar illnesses. In his bestselling book, The Black Swan, Nassim Nicholas Taleb wrote, "I see the risks of a very strange acute virus spreading throughout the planet." This book by Charles Ortleb warns that the virus causing Chronic Fatigue Syndrome is that virus. This is a must-read book for anyone who wants to know the disturbing history of the Chronic Fatigue Syndrome epidemic. Why have the CDC and NIH pretended that the communicable disease fraudulently called "Chronic Fatigue Syndrome" is a mystery for over three decades? By the end of this book of inconvenient truths the answer is crystal clear. The shocking news and bold analysis in this page-turner could lead to a revolution in the science and politics of Chronic Fatigue Syndrome, fibromyalgia, AIDS, autism, and many other illnesses. 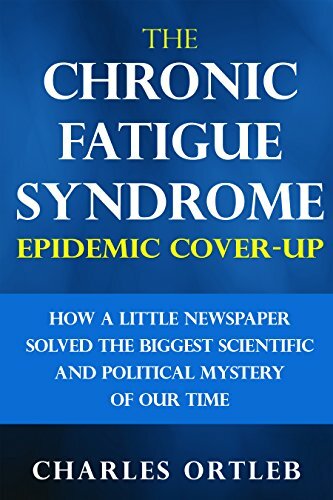 Scientists, doctors, nurses, patients, journalists, politicians, and historians must begin their journey to a full understanding of the Chronic Fatigue Syndrome epidemic with this book. As the publisher and editor-in-chief of a small newspaper in New York, Charles Ortleb was the first journalist to devote a publication to uncovering the truth about Chronic Fatigue Syndrome. He assigned Neenyah Ostrom the duty of following every twist and turn of the Chronic Fatigue Syndrome story. No newspaper in the world did more to warn the world about the virus called HHV-6 which seems to be triggering Chronic Fatigue Syndrome and many other immunological disorders. This provocative book will end the injustice of the silent treatment Neenyah Ostrom's reporting has been getting from the media and The Chronic Fatigue Syndrome community. Ostrom blew the lid off one of the biggest medical secrets of our time: the link between the Chronic Fatigue Syndrome epidemic and AIDS. Ostrom interviewed most of the major researchers in the field, as well as countless patients and government scientists. She uncovered so many similarities between Chronic Fatigue Syndrome and AIDS that she came to the conclusion that they are part of the same epidemic, and she argued that until their connection is admitted by top government researchers, there is little hope of making real progress in the fight against Chronic Fatigue Syndrome. Charles Ortleb's book captures all the challenges and excitement of running a small newspaper that was publishing a brilliant journalist who essentially was the Woodward and Bernstein of the Chronic Fatigue Syndrome epidemic. In Rolling Stone, David Black said Ortleb's newspaper deserved a Pulitzer Prize. Randy Shilts praised Ortleb's newspaper in And the Band Played On.